Well, I’ve been occupied. I’ve had it in my head for at least a couple years now that I should write a distance training manual for small dogs. Over time—using my web-log for a focus for writing discipline—I honed and refined many of the concepts and exercises that are intrinsic to my understanding of distance training in dog agility. And yet, I had a hard time staring the project from the POV of a cohesive content plan. I had an epiphany! It occurs to me that there is fundamentally no difference between training the small dog and training the big dog. The concepts are the same. The exercises and methods and objectives are identical. And so the concept of writing a specific guide for the small dog is flawed from the onset. Little dog people will tell you that their dogs have to take more strides between obstacles; they move slower; they are tiny and don’t have the speed and impulsion of their larger cousins. I find that any training objective begins with a mission statement and, you might say, the will to prevail. As often as not the little-dog person will spend more energy explaining why they can’t achieve the distance training mission than they actually do working on the distance training mission. Aye, there’s the rub. And so, I return to the drawing board free of the shackles of the misstated mission. The size of the dog makes no difference. And so what I’ve been doing for most of the past week is developing a workbook based on my own lesson plans. I’ve been living like a bear in the basement thumping on the keyboard and referencing hundreds of short articles I’ve written on distance training and handling. My objective is to publish a distance training workbook on a monthly basis suitable for instructor-led lesson planning or as a reference to the back-yard agility enthusiast. I figure that after about a year I’ll have written (and rewritten) most of what I know about training a dog for distance work in agility. This week I just wanted to give it a good start. I have a bit of editing to do yet. And I want to do my usual technical thing, putting the project in a .zip file so that the reader can click on any of the course maps and spawn it into the Clean Run Course Designer. That little detail alone represents 8 or 10 hours of work. I’ll let you all know when it’s available. I figure by January 1 it will be good to go. As a handling exercise, this simple sequence is more difficult than it looks. As a distance exercise it is considerably harder than it looks. Sometimes the solution to a distance challenge when constrained by a handler containment line mightn’t really be the best handling solution if there were no constraint to movement. 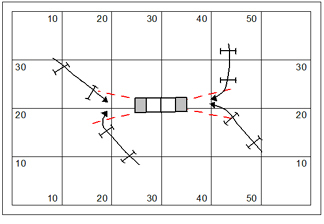 In the workbook I also intend to study handling challenges in which a distance handling solution is the most elegant. Which is true of this sequence? Questions comments & impassioned speeches to Bud Houston: BudHouston@hughes.net. And Check out my latest publication the Just For Fun Agility Notebook #30 available on the Country Dream Web Store. This discussion relates to our training plan for the week, which will be published in JFF Notebook #31 (around the first of the year). Each week we have a featured game for league play. It is my habit to build the lesson plan around the set of equipment. There’s a little bit that caught my eye in this week’s lesson plan. If you take a good look at the sequence here there’s a fair chance that the dog will take a wrong course to the dummy-tire alongside jump #3. There are a variety of ways we can phrase the discussion. But I find that one of the fundamental skills the handler needs to understand is his own path. The dog draws a great deal of information from the direction the handler is moving. In the failed movement the handler is out of position in order to conduct his Cross. A Front Cross is not a bad option at all. But this handler has failed to understand that his own path will cue the dog to direction. Take note of a couple of the Laws of a Dog in Motion ~ A dog moves in a path parallel to the handlers path; A dog ahead tends to curl back to the handler. The handler’s path must necessarily be a sharp line along the left edges of the two jumps following the collapsed tunnel. So after the dog is in the tunnel it’s the handler’s job to get up to that corner in order to conduct the Cross. Just so you don’t think I’ve been lollygagging around these days, I should catch you up on what I’ve been doing. The better part of the past week has been spent designing my very own web-store. I’ve put all of my writing products (about a quarter-million pages, I figure) on an impressive product management system at http://www.e-junkie.com. 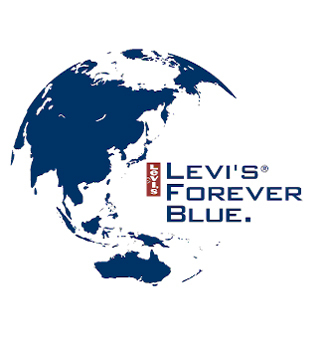 These guys provide the credit card and Paypal processing in a very secure transaction environment. Now, there’s a story to tell here I suppose. About ten years ago I bought a license for a secure proprietary web-store. The upshot of this was that I had to commit to a web service provider that charged me an arm & a leg to maintain the proprietary system and the huge data storage overhead. The webstore was techie enough that I had to contract with a fellow who would do the necessary periodic maintenance. And, at that, it was never quite as pretty or as organized as I would have liked it. There was almost constantly something going wrong technically with the system; and for a guy like me, there already aren’t enough hours in the day. Now I’m ready to close an old bank account, fire a merchant card processing company, dump my old web service provider, and save about $500 a year in the deal. With any luck, my products will be easier to find and my sales will increase. The blizzard that hit the east coast yesterday has put me behind on some outside chores with which I was already tardy. I transplanted about 40 trees from the undercover of the woods within my property. And I was busy putting them all in planters and adding to the soil so they could over-winter; but the ground froze up and I was only about half done. I also failed to haul my raft/barge up out of the pond. I don’t really want it to get locked in ice. So with any luck, it’ll warm up for a few days and allow me to go down with the tractor, and pull it out of the water with chains. I need to flip it over and do some repairs anyhow. My bad. There are a couple of projects that I can do even with the bad weather outside. I’ve milled enough 1″ lumber to do I could new sections of wainscot in the training building. I’ll get them nailed up in the next couple of days. I’m 95% finished… and have to admit that it’s looking pretty impressive. This is 364 linear feet of wainscot wall, all done with recycled and reused lumber. Another project that I only started… I was building steps from my back outside stairs into the garden. So I have two post holes dug and posts sitting down into the holes; which filled with water that is now frozen. I stopped midpoint because I had to go down to Lowes to buy a couple of long bolts which will be drilled through the posts and connected to the stair railing… and, I have to fill the holes beneath with cement. All of this construction, by the way, is merely to put two steps down from the deck into the garden. But I needed the posts so I can build a gate. I have a couple dogs that are fruit and vegetable stealing sneaks. So like I said, I need a gate. Posted in Dog Agility Training | Comments Off on OMGzilla! I’d like to share with you a brief tutorial on spacing between flow obstacles for course design in the TDAA. I am, for now, the chief course reviewer for the TDAA. Throughout 2009 I was on a mission to open up the transitional spacing between flow obstacles to the degree that play in the venue was both safe and appropriate for dogs. I find myself now in the curious position that I must work with judges in 2010 to tighten things back up again. Chiefly this is a problem of education so that our judges and course designers can understand when a short transition between obstacles is appropriate (and highly desirable); and when the space between obstacles needs to be opened up both for safety and fairness. In this first illustration I show a straight-away sequence with the obstacles spaced uniformly at 8′ interval. I would not be averse to seeing some variability in the spacing… at times as little as 7′ and as much as 9′ or 10′. Note in this drawing that the dog has a good 12′ between the #1 pipe tunnel and jump #2. A dog comes out of a tunnel blind and undirected and needs a bit of extra room to focus on the next correct obstacle. Now we’ve changed the sequence to include turns. A 90° turn deserves a minimum of 12′ for the handler to convince the dog to change directions. It is purely a matter of physics that a dog traveling a modest 3 YPS will need room to affect his turning radius. Any shorter transitional distance will have the quick little dogs forging around the jump as he comes out of the turn. I’ve included a serpentine-like 180° transition (between jumps #3 and #4). This too will deserve a minimum of 12′. The 10′ distance between jump #5 and the pipe tunnel at #6 was not an oversight on my part. Even the approach to a pipe tunnel deserves an accommodation for the dog’s turning radius. 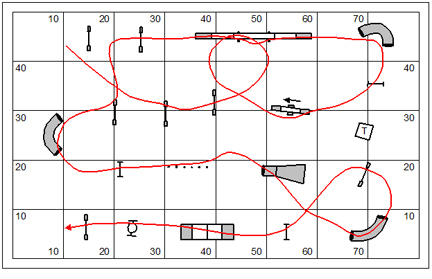 While I can order up a dog’s path out of the Clean Run Course Designer… the software is frankly ignorant of how dog’s move. The line of the dog’s dismount from jump #5 is dictated by the dog’s approach to that jump. The dog’s path in CRCD incorrectly draws a straight line from jump #5 on the approach to the pipe tunnel. So if a 90° turn deserves a 12′ turning radius… then a pinwheel will reflect a series of 12′ interval spacing. 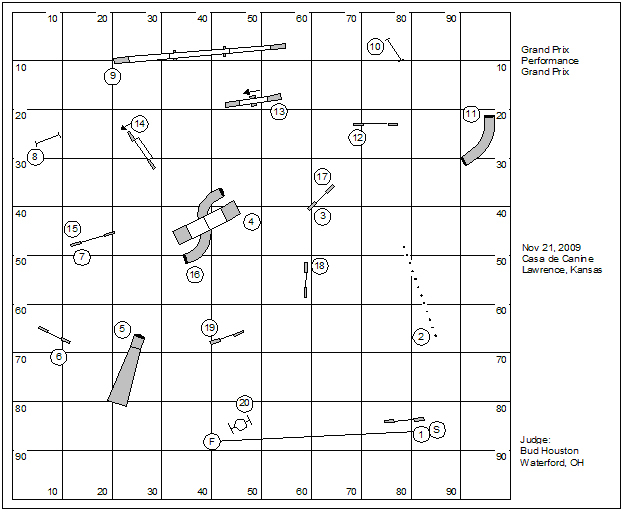 Please note that the pipe tunnel at #8 represents a wrong course option in the dog’s path through the turn after jump #5. The handler deserves an absolute minimum of 12′ to solve any wrong course option presented by the course. And frankly, 14′ would be more kindly. The #8 pipe tunnel on the approach from jump #7 is a two-headed beast kind of discrimination with which we are all completely familiar these days. The flowing approach would be to the right side of the tunnel. And yet the course designer has opted to require the dog enter the left side. And so with this challenge I have provided 14′ to solve the discrimination. By the standards of any other agility organization this is an incredibly small piece of real estate to solve the technical riddle. And by our standards 12′ is the minimum… and 14′ would be more kindly. You see! Even I will be more kindly, from time to time. This illustration presents the opportunity for several obstacle spacing discussions. The first and last jump on course must be set a minimum of 10′ from the front of the ring. The ring barrier should always be treated as though it were a brick wall. The dog needs room to start; and the dog needs room to finish. I give a little extra room for the approach to the tire. It is a special kind of hurdle that inspires anxiety and dread in the minds of otherwise level-headed people. And so we always seek to square the tire and give a little extra room on the approach so that the dog may be thoughtful in his performance. The weave poles too deserve a bit of extra room on the approach. At 10′ this sequence represents the absolute minimum room and mostly because it’s in a straight line of approach. Out of any turn, the weave poles (being a technical obstacle, after all) deserve about 12′. The teeter also deserves a square approach. Note that I use an anticipation of the dog’s turning radius to create the square. More on this later. 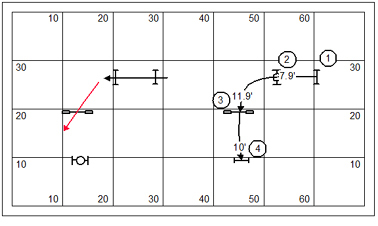 It should not be lost to you that the weave poles constitute a wrong course option to the dog coming out of the #6 pipe tunnel, and in the turn from jump #7 to #8. Once again, a wrong course option always deserves a minimum of 12′ (and, 14′ would be more kindly). A more overt option is the table discrimination alongside of jump #10. Note that I’ve provided ample room for the handler to solve the mystery of direction. 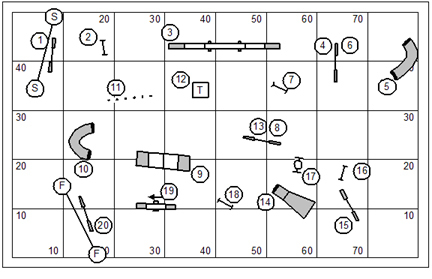 The course designer is obligated to create a square presentation of the tire. As I’ve already mentioned, CRCD will kindly draw lines to represent the dog’s path. These lines will often beguile and obfuscate. In truth the dog’s dismount from the #3 jump is dictated by the approach from the #2 jump. Frankly, only the dog moving in an inefficient manner really gets a square approach to the tire. While a quick moving little thing with an efficient turn at jump #2 will approach the tire at a bad angle. While it was correct to give the dog 10′ on the approach; it was probably wrong to use the tire as the terminal obstacle. The simple fix for this in most course design is to seek placement for the tire that is already in a nice straight line. So my simple fix for this sequence was to swap the tire for the #2 bar jump. 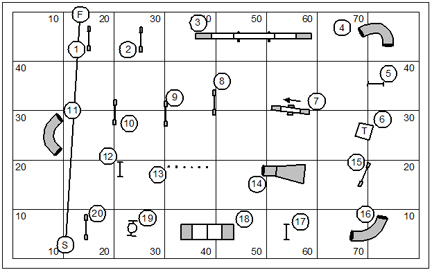 Most of our judges and course designers know that we require a square approach to certain obstacles (contacts, the tire, and to a some extent the collapsed tunnel). 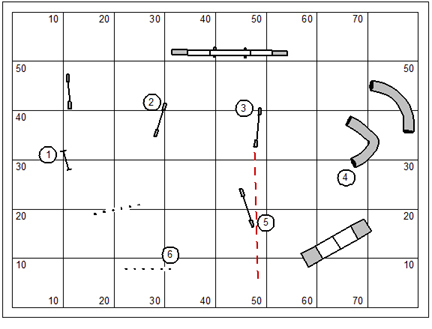 What often happens is that the course designer sees only the no brainer… create the square with a straight-away series of obstacles as shown in this illustration. However, it is also possible to create a square approach by pitching the dog into space so that the dog’s turning radius naturally brings him square to the teeter. The two jumps with the green line show a 180° curl back to the teeter. This is a perfectly acceptable way to use the pitch to create the square. The blue line labeled “Maybe” could also be used. But I would be tempted to move the teeter a couple feet to the left to ensure the square. 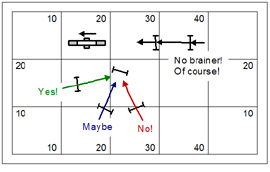 The red line labeled “No” creates a nearly perpendicular approach to the teeter which would result in a “MUST FIX” notation in my course review. However, even this can be fixed. Consider moving the teeter about 5′ to the left. Note that the dogwalk requires essentially the same approach as the teeter. And so there’s no good reason for me to repeat the discussion for the dogwalk. We can also take a no-brainer approach to the A-frame. However this obstacle too can be approached with the idea that the dog’s pitch into space creates a square approach. What I’ve done in this illustration is to create two corner-to-corner axis lines that demonstrate an area of safe and square approach. Around the A-frame I’ve drawn four different approaches that create about a 12′ square approach to the A-frame. I was careful in each pair of jumps to put the dog into the area of square approach indicated by the axis lines. This illustration presents several talking points about interval spacing. I’ve given about a 12′ approach to the weave poles. There’s a little argument to be made for the notion that the pitch creates the square for the dog on the approach to the weave poles as well. I might have given as much as 14′ for the approach, were a kindlier man. And, on the dismount from the weave poles, I’ve given a couple extra feet for the dog to come out of his weaving trance and resume movement. The approach to the collapsed tunnel too, should be square. I’ve drawn axis lines which frankly correspond to corner-to-corner within the entry barrel. When the collapsed tunnel is presented at too perpendicular of an angle on the approach it’s entirely possible that the dog can get a hip-pointer on a hard unprotected side of the barrel. And as the dog screams in agony you get to stand there as the judge and live with the understanding that your bad course design put that dog in agony. I’ve also provided the minimum 12′ approach to jump #6 on the dog’s dismount from the collapsed tunnel. If a dog comes out of a pipe tunnel blind and undirected… that must be double-true of the collapsed tunnel. And so I always provide an absolute minimum of 12′ for the handler to focus the dog on the course ahead. 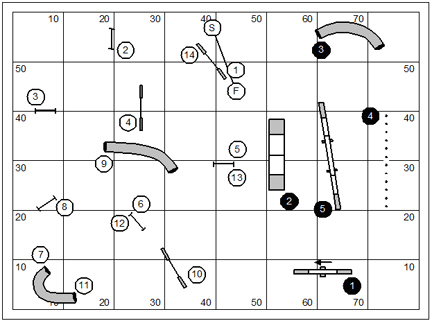 Please note that jump #1 represents a wrong course option to the dog in the transition from jump #6 to jump #7. A wrong course option always deserves a minimum of 12′ for the handler to show the dog the actual direction of the course. 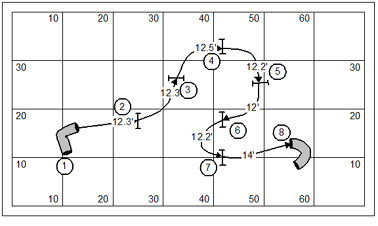 The 12′ spacing from jump #6 to #7 represents the course designers accommodation both for the turning radius after jump #6 and for the influence of the wrong course option. And, darned if I didn’t put the tire after the hard-aback turn on jump #7. Once again, the pitch creates the square. However, I did give the dog about 12′ of real estate in the turn to ensure the square. I should point out again that the first and last hurdles in this sequence are a minimum of 10′ from the front ring barrier..
Here’s a sample course for you. It’s really not a bad concept at all. But the course does have some spacing and flow problems that probably need to be fixed. Given the foregoing discussion… what course review comments would I be likely to make on this course? To tell you the truth there are often little things that I let slide in a course review. I look at the course review process as education. A person can’t really be educated if you beat the crap out of them every time they submit a course. So it’s necessary to pick the big stuff (like, what is unsafe); and leave some for the continuing education process. But, with that being said, I’m looking for a little granularity here. Go ahead and pick nits. And if you are really OCD… you might simply revise and redraw the course to a degree of perfection. Calera Oklahoma was friggin’ cold, and wet, and windy. I did six days of NADAC judging clinic… three mixed classroom/ practical and three practicing judging under NADAC rules for a Fun Raiser trial. I’ve learned heaps and have a lot of notes to sort through. I’m happy to be home. I left early on Thanksgiving day and now it’s well into December. I especially regret that I didn’t get the haircut I needed about a week before I started the trip. Did I mention that Calera was windy? Never have I maintained much of a bias for or against any agility venue. You know, it’s all rock ‘n roll to me. With that in mind I find NADAC to be pragmatic and forward-thinking and probably apart from any venue subscribing to the so-called “international standard” for the sport. I say “apart” and intend not to mince words here. This is not the same game as played in the USDAA, TDAA, or AKC. NADAC is founded on a thoughtful sensitivity for safety and fairness to the dog both in the design of courses and in the construction of equipment. Course design is intuitive. And everything is about speed and flow. You know, the reason I even attended this clinic is because I’ve wanted from the beginning to make my boy Kory’s introduction to the sport of agility in NADAC. I want him to understand from the very beginning that agility is about working at full speed. As to construction standards… if there is any one thing that has permanently switched in my brain is that contact obstacles should have a rubber surface; (yah, I reckon a NADAC person reading this would be wondering why I’ve been retarded on the point). To tell you the truth, Sharon Nelson did about a 15 minute demonstration on a full-height A-frame with a young pup who’d not been previously introduced to the obstacle. Here was a young dog wiggling around and moving with complete confidence and control on a surface that without the rubber would have had the dog scrabbling his toe-nails against a harder surface and feeling out of control. With the rubber surface the dog was completely nonplussed and in control. In terms of distance training and handling and directional control of the dog NADAC players are far superior to players in any other venue in this country. I’m sorry, that sounds like quite a preposterous claim based as it is on a nearly insignificant statistical sampling. Given the amazing distance handling I saw this past weekend… I believe it right down to my bones. So over the past week little NADAC myth bubbles have been popping left and right for me. It’s funny, if you keep hearing a thing it begins to resonate as a truth. A big one for me is the notion that competition in NADAC is “whatever’s in front of you is right!” (meaning the next obstacle). Well, that one ain’t true for sure. NADAC course design is proud to offer options and discriminations… and with the dog working at full-tilt rather than at a gathered pace. Some of my favorite students around the country, by the way, are huge NADAC fans. I regret teasing them over time about their starry-eyed affection for the venue; but remember that I’ve been influenced by prevalent myths. I see in retrospect what draws them to my teaching. I teach handling skills complimentary to NADAC… giving information to a dog working at full speed. I got a phone call yesterday from one of our TDAA judges (Holly, down in Georgia) wanting clarification on how to play the game Power & Speed. I believe I talked her through it. But after the call I decided to put this game up for our weekly league game. The fun part about this game—for the purposes of agility training—is that the performance of the contact obstacles in the Power section of the game goes untimed. That means the handler can make a big show of training with the dog and set a standard of care in the dog’s performance which should last the entire night (of training). I am personally of the belief that it is the handler’s own panic and rush that erodes solid contact performances in this sport. Oh, and I was really working very hard on the design of this game to give sweeping transitional distances between the obstacles… creating for myself an intellectual puzzle in which I limited myself to 3,000 square feet of floor space for a 14 obstacle jumping sequence. And yet, I managed to provide pretty much 20′ on average between obstacles. Note that this is not a TDAA course. In Teacup the transitional distances between obstacles would be nearly half of what is required for big dogs. The class is scored on a time plus faults basis—lowest score wins. Maximum course time is 2 minutes. If the course is not completed within maximum time, the dog and handler are eliminated. The first section of the course—obstacles #1 through #5—is not timed. However, a handler will earn a 5-second time fault for any mistake. If, for example, a dog misses the up contact on the A-frame his score would be 5 for the first part of the course—obviously, the ideal score for #1 through #5 is 0. 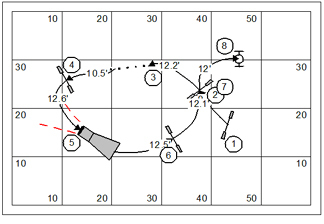 The timekeeper will start the stopwatch at jump #1 (white circle numbers) and stop it after jump #14. Any faults earned in the first part of the course are added to this time. Suppose the dog that missed the A-frame contact ran #1 through #14 in 17.2 seconds. His final score would be 22.2 seconds. The following is intended as a whimsical tutorial for a number of TDAA judges who need a nudge of help in course design. To tell you the truth, we might rightly note that this course has a proper number of obstacles for a Superior level course. And, it probably forces a couple changes of sides; though one has sapped away the challenge by forcing the changes of sides at the table. This course is, in fact, uninteresting. The trap of down and back lines is exacerbated in an even narrower venue when there is room only for three lines. That means that the course will have a down and back, and a down… with no easy way to get back at all… expiring the course at the wrong end of the field. You should note in the design of this course that it is completely cluttered. It was a labor just to get 20 obstacles out on the field and still leave room for the dog, handler and judge to operate in this small space. So, I’d like to play a little game with this course, just to see if we can add interest. All I’ve done here is drawn a random scribble of a line that clearly manages to cross itself as it goes downfield. Note that the line begins on the opposite side of the ring from where it ends. Also, I made a small attempt to incorporate a couple of the contact obstacles in the lines. The arbitrary line that I drew crosses itself three times. So, just based on the silly lines that I drew, I moved equipment around in order to fit them to the flow of those lines. 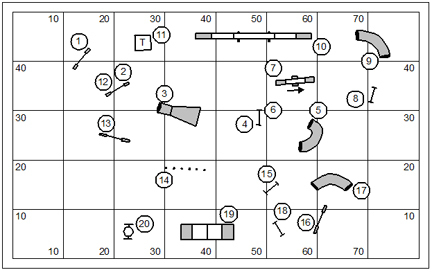 I moved the table to be pretty much in the middle of the 20 obstacles (it appears at #11 instead of #6). Note that on two occasions, when the line crosses itself, I used a jump. And, because I’m reusing obstacles, that means I get to take two obstacles off the course. The third cross is different… the dog’s path in the transition from jump #15 to #16 crosses the dog’s path from #17 to #18. This is a box cross. I really wasn’t happy with the course that I drew above. The first 13 obstacles are taken pretty much with the dog working on the handler’s right side. This is boring beyond measure. I’m not really uncomfortable going back to the drawing board. The element that was holding back the opportunity for a change of sides was really the pipe tunnel under the dogwalk. But in the course I recognized that I had plenty of real estate to reverse use the tunnel to suggest maybe a couple changes of sides. I softened the line to and through the collapsed tunnel, and changed two of the winged jumps to be wingless. I’d like to visualize someone in a wheel-chair, powered or otherwise, moving among the set of equipment. Clearly I have more work to do on the course. I need to set my start and finish lines and put identifying information on one of the borders. And maybe, I could tweak things around a bit so that it doesn’t feel quite so crowded. This week I’m in Calera, OK for a week of NADAC judges training with Sharon Nelson and will be tested under practical conditions on a weekend Fun Raiser. It’s going to be a small trial. You must know that the mind-set for judging NADAC is a radical departure from my work in other venues. And yet I am completely conscious that the judge is a stodgy arbiter of rules. I don’t mean to make that sound unkind to judges. But practically speaking the judge’s role is to accurately and completely reflect the rules, philosophy, and every other little nuance of the parent organization. I make the point early in the Clean Run book of agility games that all games are at their core irrational. And so, this week I am immersing myself in the philosophy and granularity of the NADAC world. It’s kind of fun actually. NADAC bases its fundamental premise on a small thing that should be rule #1 for training a dog in agility… it’s a full speed, wide open, running game. I’ll most likely make my pup Kory’s debut at agility competition in NADAC. I want him to know right from the onset that it’s all about attacking the course. Anyhow, it’s going to be a long week in an uncomfortable hotel… and a bit of a busman’s holiday, to be sure. I hope to come out of this an approved NADAC judge and have the opportunity to go into the world setting up courses for an audience of competitors that have a grand sense of fun. I need to go a couple weeks back in time here to the small USDAA trial we did in Lawrence, Kansas. I want to look at the Grand Prix course I set up there. The obvious tunnel under the A-frame discrimination in the early going wasn’t really such a tricky part of the course. The dog’s path truly favored the wrong course pipe tunnel. But in general the players were prepared for the moment. Dog’s were more likely to miss the down contact of the A-frame in a sequence that nearly demanded that the handler have dog-on right, while a pipe tunnel made the handler work at an uncomfortable and un-proofed distance. 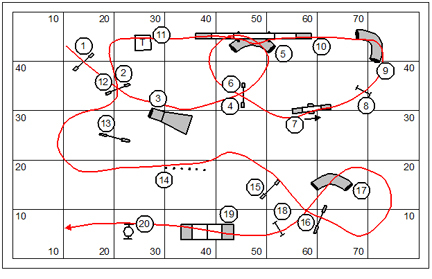 If I made a mistake in this course design it’s the hard aback turn coming out of the collapsed tunnel. I saw too many Back Crosses at the tunnel. 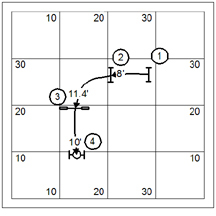 If the dog didn’t feel the pressure of the handler’s change of sides the dog would turn to the left on the exit; then the handler would be required to sacrifice any advantage in real estate to draw the dog back across the fabric and introduce the awkward serpentine sequence of three jumps that followed. Did I say that this was the most challenging part of the course? Well, it was. The handler simply did not want to arrive at jump #7 with dog on left. While some handlers got away with it, having the dog on the wrong side more likely presented the #14 hurdle as a wrong course option. So either the dog’s path wobbled badly there, or the dog actually took the option. Dog and handler face the tunnel under the A-frame discrimination again in the transition from jump #15 to the #16 pipe tunnel. We actually saw more wrong courses here than in the initial approach to the discrimination (at #4). Mostly this was due to the handler stepping in to block, but with drawing before consummating the block. You know, the very few handlers who determined to approach the #16 pipe tunnel with dog on left were far more successful in solving this discrimination and the course that followed. You’ll note that the #19 jump is presented at such an angle that it was easy to earn a refusal there if the handler drew too aggressive an approach to jump #18. So this represented on last cruel trick in the overall course. I liked the way the course ran generally. Tho I certainly had the sense that players geared their dogs down more than the flow of the course warranted. Playing for the kill is a developed instinct I suppose. 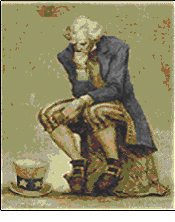 You are currently browsing the Bud Houston's Blog blog archives for December, 2009.